“FDA has issued a warning to consumers nationwide that an outbreak of Salmonella…”, reads a statement from the Food and Drug Administrations website. It seems like this is coming all to common to hear that our fruits and vegetables (tomato) are being contaminated with deadly bacteria such as Salmonella and E-Coli. The bad part about this warning is we have no way of finding out about these outbreaks before these produce find their way on our dinner tables. According to the FDA, the best way to help remove these harmful bacteria is to wash your produce thoroughly under running water. But we all know, as well as the FDA, that water alone cannot remove all of the toxic chemical residues and bacteria from our produce. And since the FDA does not recommend using any kinds of detergents to wash fresh produce, because it is not yet known if their residues are harmful to humans, that leaves us asking the question, “What are we to do.” Are we to just continue gambling the well being of our families by taking chances with potentially fatal bacteria exposures? Are we to stop eating produce which are important in maintaining a well balanced diet? 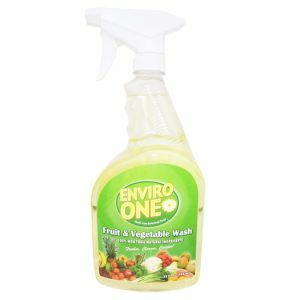 For this reason, Enviro-One is pleased to announce the release of their Fruit and Vegetable Wash, a formula made from 100% natural ingredients. An independent test has shown that Enviro-One formula effectively removes 99% of Escherichia coli (E. coli) and Salmonella typhimurium. Unlike other commercial cleaners that rely on chemicals to perform the cleaning, which can leave chemical residues that may also be harmful to your health, all of Enviro-One ingredients are found on the Food and Drug Administration’s (FDA) “Generally Recognized as Safe” (GRAS) list. Because of this safety factor, NO WARNING LABEL OF ANY KIND is required to be placed on Enviro-One formulas by any Federal, State or municipal agency. What makes Enviro-One Fruit and Vegetable Wash formula unique is the use of Colloidal Micelle Chemistry. This chemistry allows the use of tiny molecules that are so active that they can penetrate much larger molecules, and, acting like tiny jackhammers, actually break apart those larger molecules into biodegradable components. According to the Enviro-One’s website, you can use the Fruit & Vegetable wash on all produce. They recommend spraying the produce and letting it soak in a bowl of water for 5 to 10 minutes before eating or storing. You may also use it to wash your hands, cutting boards and counter tops between the preparation of raw meat and the preparation of produce that will not be cooked.